Just days after being routed 18-8 by Ivy League foe Harvard, the Quinnipiac men’s lacrosse team won 13-12 in a thrilling triple overtime matchup over Northeast Conference and intrastate rival Sacred Heart. Sophomore and Bobcat leading scorer Michael Sagl netted the game winner in triple overtime. After two overtimes, with the score still deadlocked at 12, Sagl rifled a shot past Sacred Heart goalie Jon Flood just 2:12 into the third overtime. Coming off the loss to Harvard, head coach Eric Fekete knew the matchup with Sacred Heart would be vital. More importantly, the Bobcats (5-6, 2-1 NEC) move into a tie for second with Sacred Heart but own the head-to-head tiebreaker with the win. Quinnipiac remains one game behind conference leading Bryant who is 3-0 in NEC play. The top four teams make the NEC playoffs, with the winner of the postseason tournament earning an automatic bid to the NCAA tournament. Sagl, Brendan Wilbur, and Matt Diehl each recorded three or more points. Sagl scored a hat trick while Wilbur finished with four points on two goals and two assists. Diehl tallied two goals and an assists for three points. Sagl now has 15 straight games with a point dating back to last season. Furthermore, he has registered multiple points in 14 of those 15 games. Basil Kostaras scored his 54th and 55th career goals. Jake Emms, Chris Messina, Pat Corcoran and Dylan Webster each added a goal. The Pioneers (2-9, 2-1 NEC) were led by Cody Marquis who tallied a game-high seven points with a career-high five goals and added two helpers. Matt King and Matt Gannon each had five points on the night. King had four goals and an assist while Gannon, the reigning Northeast Conference Co-Player of the Week, had a goal and a game-high four assists. Stephen Kontos won 23 of the 29 faceoffs in the game with a career-high 15 ground balls. Trailing 11-9 going into the fourth quarter, Quinnipiac needed to come back from a deficit twice in the final frame. Wilbur scored his second of the game on the man-advantage to cut the deficit to one. Kostaras tied the game at 11 with his 15th goal of the season. Matt Gannon scored his only goal of the game on the man-advantage to give the Pioneers, a 12-11 lead, but Sagl found the back of the cage again. Diehl fed a pass to Sagl who charged through the slot and rifled a shot past Sacred Heart goaltender Jon Hood to knot the game at 12 with 5:36 left in regulation. The Bobcats had two chances in the final minute, but a shot by Wilbur was denied by Flood and Sagl’s shot was just wide. Both offenses had few chances in the two overtime periods before Sagl netted the game-winner just two minutes into the third overtime. King had two chances to seal the win for Sacred Heart in the first overtime, but had a shot saved and a shot rang off the post. Wilbur had a shot saved by Flood in the final 30 seconds of the first overtime. The Pioneers had a chance to win the game with an extra-man opportunity in the final 31 seconds as Quinnipiac was penalized 30 seconds for offside but a shot on the doorstep by Mike Mawdsly went wide. Quinnipiac won the ensuing faceoff to start the third overtime. Pat Corcoran had a shot blocked, leading Flood to scoop up the groundball and start the Pioneers clear. Sacred Heart turned the ball over and Sagl scored as he dodged to the net and deposited the game-winner. Gill Conners recorded 18 saves for Quinnipiac. Conners has at least 10 saves in nine of the 11 games, while posting 15 or more in four of them. Hood stopped 16 shots for the Pioneers. Both teams posted 49 shots in the game – a season-high for the Bobcats. Quinnipiac capitalized on the man-advantage going 5 of 9, while the Pioneers went just 2 of 8. The Bobcats won the turnover battle 17-14 but the Pioneers won more draws 23-6 and corralled more ground balls 40-29. 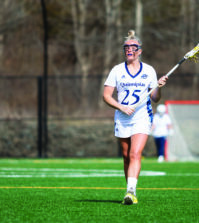 Quinnipiac resumes Northeast Conference play on Saturday with its final home game of the regular season. The Bobcats host Wagner College at 12 p.m. on Senior day at the QU Lacrosse Turf Field.